Experience unparalleled luxury at this palace on the sea, Chateau De La Mer! Oceanfront living is at its finest at this newly constructed manor. The unique location of this vacation home in Pine Island gives guests many opportunities to watch the sunrise over the ocean and the sunset on the sound from the plethora of decks. Perfect for a memorable family vacation, this 16-bedroom retreat boasts lavish characteristics throughout. The top level great room features spacious living and dining areas, including oceanfront deck access. Cooks will love the well-appointed gourmet kitchen, which makes meal prep a breeze. A separate catering kitchen adjoins the regular kitchen and allows caterers to store or prep food and clean up without disturbing guests during events. The Olde English Pub is a fully functioning pub with deck access, which allows you to go to the bar without leaving the house. Ideal for enjoying an evening cocktail while watching a stunning sunset. Two king master bedroom suites, each with a whirlpool tub and private balcony, are located on the sound side of the top level. The middle level of the home showcases a suite, with an attached sitting area/den and a private balcony. Seven master bedrooms, each with a king size bed, and an exercise room are also located on this level. Guests will flock to the den, with gas fireplace, that features a beautiful boat-shaped bar. Oceanfront deck access is offered just steps from the boat bar. The lower level of the home was designed with entertainment in mind. A sports bar with an arcade and pool table are sure to facilitate many hours of play. The kitchenette in the rec room ensures that beverages are cold and snacks are handy. Screen the latest movies in the theatre room that comfortably seats 12. Little ones will love the kids cave, a playhouse area that is just their size. Six master bedrooms, a cabana bathroom, and laundry room complete the lower level. Step outside to the impressive pool area for a day of fun in the sun. 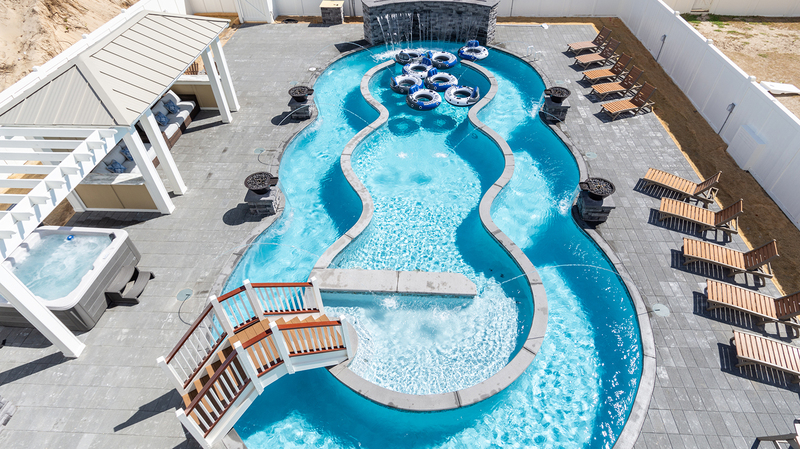 The swimming pool features the largest private lazy river on the Outer Banks! Take a stroll down the private walkway to the beautiful Corolla beach. Chateau De La Mer provides an upscale oceanfront beach vacation like no other! Six MBRs (K, K, K, K, 2Duo, 2Duo); sports bar with arcade, kitchenette and pool table; theatre room with seating for 12; kid's cave; cabana half bath; double laundry. Bridal Suite MBR (K) with sitting area/den; seven MBRs (K, K, K, K, K, K, K); library; den with gas fireplace and boat bar; exercise room. Two MBRs (K, K); great room with gas fireplace; kitchen with range, refrigerator, dishwasher, and two sinks; warming kitchen with range; sink; dishwasher, and refrigerator; dining area; half bath; Olde English Pub. Reduced greens fees at the Kilmarlic Golf, beach cabana service provided from April 29 to September 28 only (provides morning set-up and afternoon take-down of two umbrellas and six beach chairs on the beach). The Advance Property Hold fee is $1,000. 8/30/18 For the 2019 season, this home will no longer allow Special Events. We loved the home. It had everything our family needed to enjoy our week in OBX. We had plenty of room and all could enjoy their personal space at the same time. There was enough room to have several activities going on at once. Overall, as a family and individuals we said this was the best year yet. Looking forward to the next. Everyone also agreed on the same house. Absolutely Gorgeous home. Well designed and well equipped. Lots of space for fun, for big-group meetings, as well as personal, alone-time. We have a large family and a planning a return trip to "The Chateau".